Viviane Reding, Vice President of the European Commission: "Democracy is not an easy endeavour"
Getting people in the EU to buy into the European dream, particularly in the midst of the current economic crisis is proving difficult. However, despite resistance, the EU’s justice chief and Vice President of the Commission Viviane Reding believes that Europe will need the involvement of its citizens to survive. Euronews spoke to her about the European Commission’s latest public consultation to do this as well as the ongoing political turmoil in Romania. 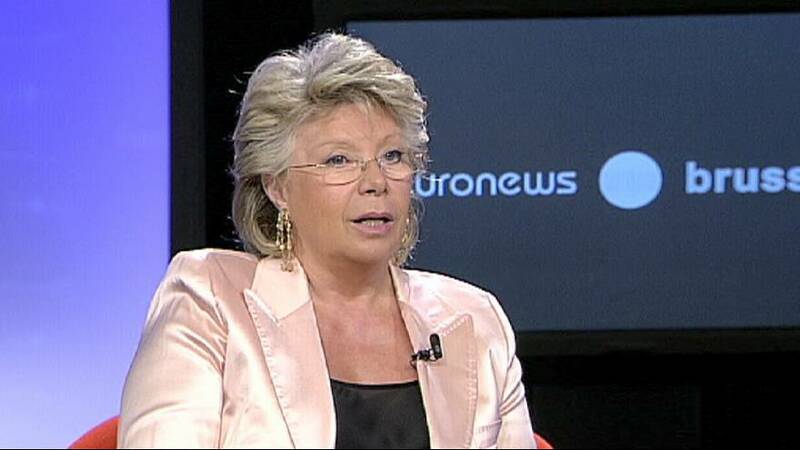 Viviane Reding, Vice President of the European Commission, welcome to euronews. Thanks for joining us. I’d like to start with the four month consultation which has been launched by the European Commission. The stated aim is to find out what problems people face in the EU. You’ve said the feedback you get will go directly into forming policy in the next few years – but given the existential crisis facing Europe at the moment: what do you realistically hope to achieve with this initiative? Europe is our common house and it cannot be built only by politicians, who then, when they have finished the building, say, ‘oh: would you like to move in?’ We have to build that together with the citizens, and I think one of the problems of the past was that we never asked citizens what they think about Europe, about their common house, about their living together with other people, the five hundred million, and it is high time that we change this. Would you accept that it (public consultation)doesn’t go anywhere near to addressing the big democratic deficit that currently seems to be lying in the heart of Europe? But, look, the democratic deficit is that citizens so far have the impression, rightly or wrongly so, that they have never been asked their opinion, so it is high time to start this and to build this up. These are the first steps, because now we will have a whole year of consultation, on the spot, in the cities, in the villages. And then we will have the European elections, where citizens are again asked to elect their euro-parliamentarians, but this time, knowing why they are electing them. This is all very well, but it’s going to take time, and the problem Europe seems to be facing at the moment is that it is running out of time: doesn’t it? That is why we start now at once. So that when comes the European elections they will know why they vote for this person, to represent them with this idea, in a reinforced European parliament….. If I may interrupt you. You know very well that the turnout at European elections has dropped every time that there has been European elections. People don’t connect with the European parliament! Absolutely. The European parliament has an immense power to represent the European people and people don’t know it. So the implementation of the voters, of the citizens, into this new Europe is very important. And that is why I’m so happy that most of the answers which we go now, the big majority people under the age of 30, we have to reconnect them with their future, and their future is being built now. With them, I hope, and not without them.